There are no shortage of options for flying between LAX and London. We always focus our search on direct flights offered by Star Alliance carriers, given our membership in United’s Mileage Plus. 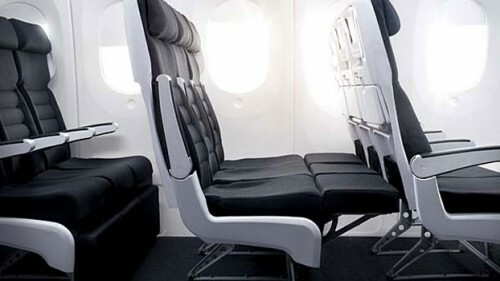 We were intrigued when Air New Zealand (a Star Alliance member) offered the cheapest fare for our trip to London, and also offered a reasonably priced upgrade option to their economy “Sky Couch“, a block of 3 seats that include footrests that fold up for a bed. Although we’ve flown together to Europe 3 times, we have always arrived in the evening. For our London trip, we were arriving in the morning with a full day ahead of us. We figured the extra investment for the Sky Couch to improve our chances of sleeping would be a good investment. Air New Zealand’s Sky Couch. Photo courtesy Air New Zealand. We were very impressed with Air New Zealand from the moment we boarded. Air New Zealand operated their London-LAX-Auckland route with brand new 777s with very sleek interiors. The personal televisions (PTVs) in economy class are the most sophisticated we’ve seen, with extraordinary entertainment selection (literally hundreds of shows/movies) and the ability to order snacks and drinks. We even enjoyed the safety video, which was filmed using Lord of the Rings characters. Before takeoff, the flight attendants demonstrated how we could raise the footrests and use the special “Sky Couch” safety belt, which would allow us to lay across the seats securely. The meals offered in flight were surprisingly unique. Instead of the usual fare of fettuccine alfredo and meatloaf, we were offered things like provencal beef with white bean salad and beef madras curry. And they weren’t bad! Like many European carriers, Air New Zealand offers free wine in economy class, before, during, and after the meal (and available through the PTV order system!). The “Sky Couch” itself was not as comfortable as our bed at home, but definitely an improvement over a standard economy seat. I’m convinced that we squeezed in at least 2 more hours of sleep then we would have without the upgrade, and it was also nice not worrying about sharing a row of seats with a third person (e.g. asking to go to the restroom in the middle of the flight). After we arrived in London, we actually had plenty of energy for an ambitious day of adventure, including our first pub grub lunch, a ride on the London Eye, and an Indian dinner–all manageable with just a short cat nap in the early evening. Our only real disappointment with Air New Zealand was the revelation a month later that we did not earn the 10,000+ United Mileage Plus miles we expected from the trip. Even though our airfare was not “killer”, we found that we were booked with booking class “K”, which is not eligible for United mileage accrual (see reference here, just one code up, “T”, earns 100%). Although we have always chosen a Star Alliance carrier for our trips to Europe, at least partly due to incentive of earning United miles, I’m not absolutely certain our decision would have been different if we had known. At least now, we are aware that mileage accrual through Star Alliance is often dependent on booking class. In planning future trips, I have been checking the booking class associated with the fare and researched the mileage eligibility on United’s website. We’ve already discussed using Air New Zealand again on our next trip to London, and I expect we will get the “Sky Couch” again if it remains a good value. Hopefully, we’ll be able to book in a class that earns United mileage. This entry was posted in Recommendation, Transportation, Travel and tagged airlines, London, transportation, travel planning by Ryan. Bookmark the permalink.